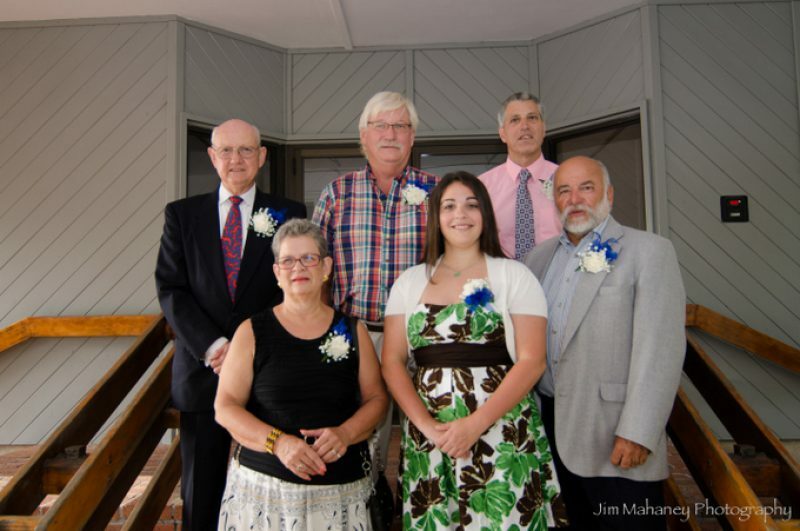 Six new members of the Fairhaven High School Hall of Fame were inducted at the Century House in Acushnet on Sunday evening, June 27, 2012 to culminate a successful Homecoming Weekend. Pictured left to right are: front row: Mina Daffinee (daughter) representing John Morgan ‘38, Tiffany M. Therrien ‘01, Coach/A.D. David Medeiros, back row: John Everett ‘61 (Lifetime Achiever), Stephen Vining ‘63 and Armand “Mickey” Santos ‘76. Photo courtesy of Jim Mahaney ‘68. Steve came to Fairhaven High School in 1959 to further his education and to “play” and play he did. Steve played sandlot football, then played the trombone in the marching band. In winter he played JV basketball and also found time to play in the FHS dance band. In the spring that first year Steve played Varsity baseball and continued to play music. Steve always played! During his sophomore year, he played football, basketball and baseball. The baseball team was the Bristol County League Champion with a record of 18-2. In the State Tourney they went 1-1, losing to eventual State Champs Wellesley High School. During his junior year Steve continued as a 3 sport athlete while always finding time to continue his musical endeavors. The baseball team compiled a 14-2 record that year with Steve contributing as a pitcher and first baseman. As a senior, Steve’s exploits continued throughout the year. His football career blossomed to the extent he earned a four year scholarship to the University of Bridgeport as a tight end. During the baseball season he continued to flourish including a game on June third against Taunton High School where he was on the mound in a 6-2 win, striking out 18 batters while going 2 for 2 with 4 RBI’s. Boy could Steve play. Also during his senior year, as if he did not have enough to do, Steve added track and field to his repertoire and boy did he excel. He immediately became a sensation running the quarter mile, consistently winning, culminating with a win at the Class D Meet. On June 4, at the All-State Meet in White Stadium, after a false start, Steve was pushed by overall State Champion Alan McCafferty of Quincy who ran a blistering 50.4 seconds, inches behind was Vining with a time of 50.5 seconds for second place. He also anchored the mile and half-mile relay teams at the Class D Belmont meet which Fairhaven won. Yes, Steve could also run. At the Fairhaven High School year end assembly Steve received the prestigious Sparrow Cup, given to a student for meritorious service in Fairhaven High Athletics. It was a day Steve was not asked to play his trombone. During his football exploits in college, Steve played well enough to attract the interest of the professional football team the Chicago Bears until a knee injury his junior year scratched him from the Bears’ wish list. Not one to sit back, Steve decided to play baseball and became the “Purple Knights” work horse, pitching in 15 of 20 games (missing 5 games due to injury) compiling an ERA of 2.68, earning the University’s Athlete of the Year Award in 1966. Although Steve says he was not very good at playing the trombone, we tend to dispute that. Steve Vining was truly a man for all seasons and play and run, he did! John Morgan 1938 John was a three sport letterman at Fairhaven High School graduating in 1938. In football John shined as a shifty half back and quarterback. During his senior year he earned All Bristol County honors along with teammate John Silva. John had many great games including two that really stand out. In 1936 Fairhaven defeated Taunton 13-6 with Morgan scoring the two touchdowns. In another 1936 game, showing his versatility, John threw for three touchdown passes in a 20-0 rout of East Providence. John was captain of a very talented basketball team that fought to a second place finish in the Big South Shore Tournament. In baseball John was an outstanding second baseman and the “sparkplug” of the team. John, who was class president his junior year, was one of four exceptionally athletic brothers who all played for Fairhaven High School. Fred is a Hall of Famer, Phil an outstanding lineman and Claytie, like John, a three sport letterman. John served in the Air Force during WW II in Iceland & Greenland as an aircraft mechanic achieving a rank of Staff Sergeant He married Barbara Sutcliffe in 1946. They had a daughter Mina & three sons Dana, John Jr. & Robert who all played sports. John was an active member of the Fairhaven Varsity Club, the Masons & Eastern Star. He was elected to the Fairhaven school board in the early 1950’s serving as the Chair of the board that brought Mr. Lynwood Harriman to town as the superintendent in 1958. John died at age 41 in 1962 due to a blood clot after successful open heart surgery. Even after 50 years his family still misses him but knows that he left this earth a better place for being a great husband, father & citizen. Mickey was an outstanding three sport athlete at Fairhaven High School for three years earning eight letters for football, basketball and track. Santos went on to earn a scholarship to Boston University to play football. Mickey helped lead Fairhaven football to two South Coast Conference Championships and was a 1975 Standard Times All-Star and also earned All S.M.C. honors. An excellent scoring force, Santos was in the top ten of his division in the state scoring 10 touchdowns while totaling 62 points in 1975. Two outstanding games for Mickey include a three touchdown game against Seekonk leading to a 32-0 victory and another three touchdown scoring game versus Bourne in a 26-0 win. In his senior year he was captain of both the football and basketball teams. In basketball Santos was a two year varsity player who was clutch under pressure. He had a game winning basket in a 51-49 barn burner against Old Rochester and in an upset win over New Bedford Vocational High School Mickey scored the last ten points of the game ending in the 46-44 victory. In track and field he was a Standard Times All-Star excelling in the 100 yard dash, the long jump and the relay team. Mickey is a counselor at Dartmouth High School and he and his wife Kyle reside in Lakeville with their three daughters. Mickey is also the son of Fairhaven Varsity football legend Armand Santos. Tiffany Therrien was a true work horse in Fairhaven athletics. Over four years she earned 12 varsity letters and was the captain of 6 different teams. She was a Standard Times SUPER Team All Star for both Indoor and Outdoor Track her senior year and was a South Coast Conference ALL STAR 7 times for track and cross country. Her senior year she was “The Most Valuable Player” for both Indoor and Outdoor track earning 128 points in a single season, far more than anyone else on either the boy’s or the girl’s teams placing her in a very elite group. Tiffany was the South Coast Conference CHAMPION in the 100m high hurdles in 2001, with the schools second fastest meters’ time ever. She also placed 6th in the Triple jump and was 6th in the 100m hurdles at the State Class D Meet. She placed 2nd in the 300m hurdles at the Conference Championships her sophomore and junior years with the school’s 2nd fastest meters’ time, (second to Hall of Famer sister Crystal Therrien), and was 6th at the State Class D Meet in the 300 hurdles her sophomore year. The 4 x 100m and 4 x 200m relay teams she was on won the SCC Championships. Tiffany was a total team player and would do anything her coaches asked her to, resulting in her competing in any event from the 50 hurdles all the way up to the 2 mile. She also qualified for the State meet in every event she competed in and medaled in the high jump, triple jump, 100m hurdles, 50 yd hurdles, 300m hurdles, 4 x 100m, 4 x 200m and 4 x 400m relays at the SCC Championships over her career while accumulating 7 medals at the State level. She was a triple or quadruple winner almost every meet during the regular season and earned Standard Times Player of the Week honors many times. During her two seasons of Cross Country she was an All Star both times, set the course records at both the Mariner Course and the Hastings Course. She medaled at The South Coast Conference Championships both seasons placing 12th and 14th and was 3rd at the SCC Coaches Scramble in 16:14. Tiffany has two other school records: the 4 x 100m and the 4 x 200m relay teams with, sister Crystal, Jen Nowak and Amy Furtado, those records still stand. Tiffany was a member of the National Honor Society, a Scholar Athlete all four years and an “Athlete for All Seasons”, she also earned the Standard Times Leadership Award, and the SCC Sportsmanship Award several times. Tiffany graduated from UMass/Amherst where she was a member of the Division 1 track program for one season and a collegiate cheerleader on a scholarship. She earned her Master’s Degree in Criminal Justice from Bridgewater State University and is currently pursuing a Bachelor’s Degree in Nursing from Rhode Island College. She is the daughter of Wally and Linda Therrien, has 2 brothers: Jeremy and Timothy, and is the sister of Hall of Famer Crystal Therrien. David Medeiros graduated from New Bedford High School in 1965 and UMass Dartmouth in 1969. David had an illustrious career at Fairhaven for 34 years as an educator, teacher of English, History, Journalism, Coach and Athletic Director. David was assistant football coach for 18 years, Indoor track coach for 15 years and FHS Girl’s Track Coach for 19 years. David was athletic director for 11 years. Under Medeiros’s guidance, sports programs grew to include 17 varsity sports. David was responsible for adding night volleyball and girls’ varsity and junior varsity soccer, golf, girl’s freshman basketball, girl’s junior varsity softball and a cooperative ice hockey team with Old Rochester. David was District D Athletic Director of the Year, 2002-2003. During David’s period as AD, much was accomplished. Instituted, were some awards for students: the Scholar Athlete Award, the Athlete for All Seasons Award, the 4 years/3 seasons award (presented to graduating Seniors), the reinstitution of the Watch Award (presented to graduating Seniors who lettered in two sports for two years or one sport for three years). This was funded by the All Sports Booster Club until they disbanded and then the funding was taken over by the Athletic Department. David sought recognition for our athletes by participating in the Wendy’s High School Heisman Award and Women in Sports Day, the Boston Garden Good Sports Award (Fairhaven had a number of winners of this award) and participated in a variety of MIAA Sportsmanship recognition efforts. During David’s time, he rewrote the Athletic Handbook placing emphasis on academics, cooperated well with the faculty and administration, and weathered a few storms. The entire building/addition project took place during David’s tenure and the teams had to hold games and practice at many off-campus sites, which required much coordination of buses, host schools, etc. The FHS Hall of Fame began during his tenure with the impetus coming from the community at large, making it truly a community project. David encouraged (maybe even made it mandatory and provided a cost-free avenue) for all FHS coaches to become CPR/First Aid certified to better service their students. Under his leadership, a full-time athletic trainer was added, serving all sports (not just one or two). Dave’s accomplishments, as the Director of Athletics, overshadowed his coaching success and had a positive influence on many more students and programs. David is proud of what occurred, at FHS, during his tenure. Generally, David just tried to be there for the Fairhaven student athletes, their parents and their coaches. David stays busy as an instructor and tutor, at the Northeast Maritime Institute, and as a USCG Licensed Captain on his 20’ Grady White used for pleasure and fishing at the Elizabeth Islands. Capt. Dave Medeiros offers charter and guide services. David is devoted to his wife Beth, of 42 years, son Matthew (FHS Class of ’93), daughter Sarah (FHS Class of ’90) and grandchildren, Bella, Max, Sofia, Benjamin and Dylan. David lives in Fairhaven in the home of the former legendary coach and AD of FHS, Mel Entin – the legacy continues………………..
Born to a Fairhaven fishing family Dr. Everett attended Rogers, East Fairhaven and Fairhaven High School, graduating in 1961. He received an engineering degree from NB Institute of Technology and holds his Masters and Doctorate from Florida State University. Dr. Everett has held two positions within government for the past two decades, NOAA Fisheries Director of Policy and Planning and Chief of Research while also serving as Deputy Director for Research: and Chief of Research for the United Nations Atlas of the Oceans in Rome. He has testified before the United States Congress (both Senate and House) as an expert witness on fisheries ecosystems, ocean acidification, global climate change and the Gulf of Mexico oil spill. Currently he is President of Ocean Associates, Inc. an oceans consulting business that employs 150 people in 6 states and several countries. A highly respected scientist, Dr. Everett has been selected by scientists and politicians from around the world to chair scientific analyses by the Intergovernmental Panel on Climate Change. From 1996-2002 he served as Chief, Research Division of NOAA/National Marine Fisheries Service. Prior to that, he was the Acting Director of the Office of Research and Environmental Information in the field of marine fisheries, biology and oceanography. He was involved in the coordination of the Apollo launch, developed the UN Atlas of Oceans and created the Oceans Art.US and TechnologySite.org websites. Currently living with his wife, Kristin Vehrs, in Arlington, Virginia, he has three children and two grandsons. He can be reached at JohnEverett@OceanAssoc.com.